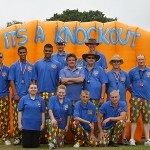 It's A Knockout's blog: challenges, news, events, info & more! 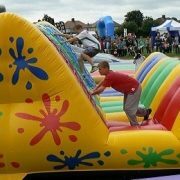 It’s A Knockout Games For School Events. Many attractions and services that are available for hire for school events just can’t cope with big numbers, or can’t cope with the temperamental British weather. 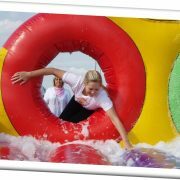 An “It’s A Knockout” however easily copes with numbers over 200-300-400 and more when ran in the right manor and can also be ran in all weather’s or re-located to a schools sports hall. This makes it ideal for schools and the like for activity days. 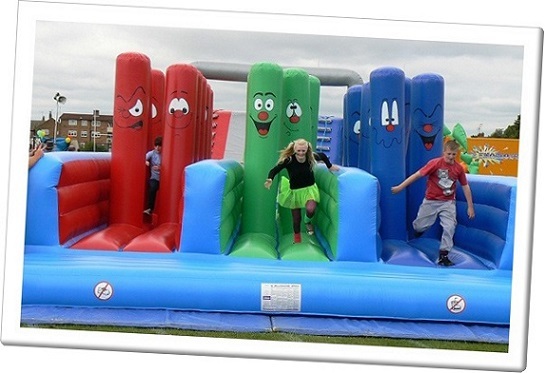 “It’s A Knockout” uses games and inflatables that are colourful, fun and exciting. Also the bigger the set of games, the more inflatables, colourful and adrenaline based it is. As an example, we at Knockout Challenge offer three sets of games, graded as Bronze, Silver and Gold. 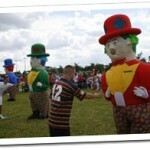 Each set with a better and more exciting set of games using more and bigger inflatables. As an example, our “Bronze” set of games needs just under half a football pitch in room, a “Silver Show” just over half a football pitch, and a “Gold Show” needing a whole pitch. Knockout can fit into a morning or afternoon school timetable and even be ran in both with different children/classes/forms/houses taking part each time. There are a number of ways for the children to be split into teams. The games tend to be designed for teams of around ten in with each game using three teams per heat. Getting the children into these teams can be done as follows. 1. Forms. If a form has around 30 children in, each form can be split into three sub-teams of around 10 in each. One sub-team in each of the three lanes for a game. The “times” or scores for the 3 sub-teams are then added together to give a “form time” for that game. The advantage of this is that the form tutor can remain with their class whilst they go from game to game. 2. Houses. If a house system is being used, groups of ten for each House can play against each other. 3. Or you can let them group themselves into teams (however this may cause problems). Either way we have a points system for the games that we use and each team will have a score card with their scores on at the end which can be used for an inter-house competition etc. Plus everyone, in every team gets the chance to take part in every game. No one gets left out. However, individuals can opt out at any time, it just means that someone else does their go for them. We have wristbands available if requested to help with team identity. https://www.itsaknockout.org/wp-content/uploads/2017/01/schools001.png 713 1015 Phil https://www.itsaknockout.org/wp-content/uploads/2017/01/its-a-knockout-300x138.png Phil2014-01-21 14:31:112017-02-17 14:59:01It's A Knockout Games For School Events. Believe it or not, we’re planning the 2014 Children’s Hospice South West Knockout Challenge. If you weren’t there last year you have a chance to find out what you missed. If you were there last year, you have a chance to come and do it all again!! If you’re really tough – or just barking mad – you could do both! Children’s Hospice South West does a fantastic job helping to build precious memories for families whose children are living with life-limiting or life threatening conditions. They rely on the generosity and efforts of people like you to help deliver their promise to ‘make the most of short and precious lives across the South West’. We hope that you never suffer the agony of having a child with a life-threatening condition, and ask you to join us for the day to celebrate the lives of your own children and help this truly worthwhile cause at the same time! Why not get together with some friends or family, enjoy a jolly good day out AND help a really worthwhile cause! 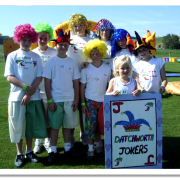 Visit the Children’s Hospice South West Knockout page for more information and fund-raising details, or visit It’s A Knockout to arrange a Knockout Challenge for your charity. Team Building exercises, away-days and events are an essential process for many companies to aid the bonding and effectiveness of its employees to make a workforce which acts more productively which in turn means a business with a loyal workforce that generates greater profit. Employees work best when they work together. Sometimes, people in one department or sector of a company won’t see, interact or even know you from others in a different sector from them. This can cause friction and resentment which rusts rather than oils the wheels of a workplace. An away day, in an informal setting, with some fun activities is an ideal way to get employees to know each other and break down barriers. How many would be doing this? Where to do it? What to do? Don’t be afraid to ask for help. There are many event companies out there that will suggest or organise things for you. These “Event Management” companies will be able to suggest a magnitude of various activities. This may be influenced by the time of year you are planning to have the event take place. Indoor events with fewer people can offer many more choices than an event that needs to accommodate large numbers. For this Blog we’ll look at the larger numbers away day (say over 200 people). The BBC Apprentice TV show had this very subject as one of its tasks this year. As experienced organisers of Team Building Events and Away Days, we found some of their tactics amusing and quite worrying at the same time. There are some things that definitely need to be sourced from the “experts” – experienced and seasoned suppliers of these days. Organise it yourself or use an Agency? How confident are you at setting up a team building day? Using an agency can take a lot of the stress and pressure off you but bear in mind it will cost more. Event Management companies will have a mark-up, and also may well be more partial to things they get a greater “mark up” on – in certain cases this mark-up can add thousands of pounds to the final bill. In our modern world today, the Internet is usually the starting point. If you have a few months and a bit of spare time and don’t mind some leg-work there are a few trade shows that may be worth attending. 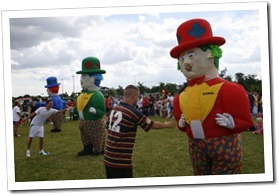 The Showman’s Show in Newbury and The Event Production Show in London are just a couple of such examples. They tend to be held in places such as Earls Court or the NEC in Birmingham. Try a search and see. However don’t rely on these to be the answer to your sourcing needs. You could even ask people in your company for ideas. Have they done something like this before? What was the feedback? day out for 300 is unlikely to appeal to the majority, not to mention that a zip-wire probably couldn’t cope with those volumes. Try to find activities that appeal to the majority of people’s abilities. Keep in mind that what you think is “great ” may be less appealing to others in the group. Always remember the target or reason for the day out. Bringing people together, interaction, fun, constructive and of value. This may feel like an impossible scenario for some, especially if you have a big difference in types of colleagues around you. This is where maybe an event company will be of an advantage. However, don’t be afraid to phone a few suppliers up and ask their advice. Shortlist things, have a discussion meeting. Paintballing is often suggested, but we’ve found that it can be too aggressive and competitive, with little team building. It maybe okay for small, male only groups, but not usually for mixed ability/age group. Treasure hunts are also often suggested but again, only really effective for small groups. There are lots and lots and lots of choices out there. However, the vast amount of these are not adaptable, versatile and can cost with large numbers. Archery, laser clay pigeon shooting, 4×4 driving, crystal maze or the like can only cope with small groups, so you end up with less of the “Welcome to the team day – everyone over here”, and more of the “Welcome to the team day, now we’re going to send you all off in differ directions “. Versatile, Adaptable, Fun team building. We have over the years developed activities and games that are almost a “fits all” for away days. 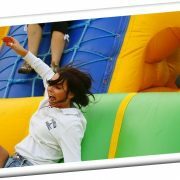 It forms many guises from Sports Day, to a Bouncy Olympics, to It’s A Knockout. It copes with numbers as small as 20 to as large as 1,000. Indoors, outdoors, grass, hardstanding, Astroturf and more. Rain or shine. Old and young. Fit or unfit. It can be scaled up, or scaled down. Many games have multiple elements meaning that people can choose the part of the game to participate in that suits them the best. Although the core of the day is games, it can be expanded to encompass more. A session of designing a Joker Card can be run for example (a sort of Art Attack meets Blue Peter creative time). Also the creation of Team names, slogans, chants etc means the teams have to communicate and interact with each other. Also, there are bound to be a few people unable to take part in the physical challenges due to ill-health or injury – they can be enrolled as “cheer leaders” for the teams or score for the games. Or even, give them digital cameras and make them the “paparazzi” for the day and they can take pictures. 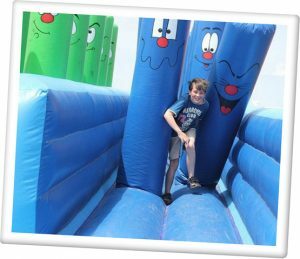 From simple Sports Day games such as Egg & Spoon to ones that use large colourful inflatables the games will involve everyone in a fun, inclusive, bonding away day that will be a worthwhile experience. 2014 I hear you say – that’s ages away! Well, my calendar says we’re 3 months away from Christmas, and then the bleak depths of winter before we emerge into the sunshine (hopefully) of spring! 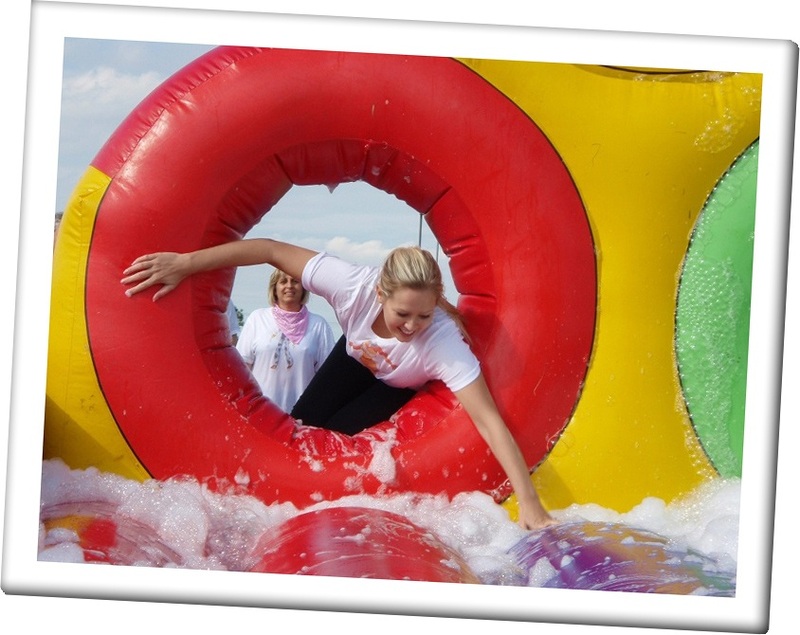 So what better time to book a Knockout Challenge for your charity fundraiser, or plan a Knockout Challenge to boost staff morale after the winter. 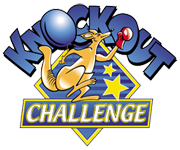 Knockout Challenge offers a package to suit all budgets and requirements. 18 teams covered, but more can be added. Ideal for the smaller event. 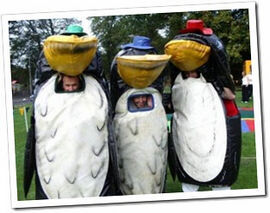 Includes The P-P-Penguin costume dressing up game. Includes prizes, as well as our comprehensive Information & Publicity Pack. Half size of a football pitch area of games. Ideal for the bigger event. Can be expanded to cater for 1,000 people. Ideal for Youth Camp Activity Days. Starting price covers up to 8 teams taking part. Can be ran wet or dry, indoors or out. So there you have it – a brief guide to all our packages. Please click on the links above to find out more about each package or give us a call and we will help you choose the right one for your event. Can Charities Really Make Money from a Knockout Challenge? Well, obviously we think they can! Charities are finding it more and more difficult to raise funds in this difficult economic climate, and it can be heartbreaking to put huge amounts of time, effort and even money for very little return. At Knockout Challenge we do all the work organising, setting up and taking care of all the details. Your event is listed on the events page on our website, and we can create an event on our Facebook page for you too. Your role is to help create even more interest and enthusiasm, and turn up on the day to enjoy the event. We have put together this example (based on real examples) of how much money some of our clients make from hosting a Knockout Challenge. 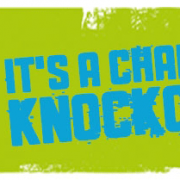 Knockout Challenge has been in business for over 17 years, and a lot of the events we run are for charities that return to us year after year for their fund-raising efforts. Our Knockout Challenges are run to a tried and tested formula, and we are aware of and comply fully with all necessary laws, health and safety considerations, and are fully insured. 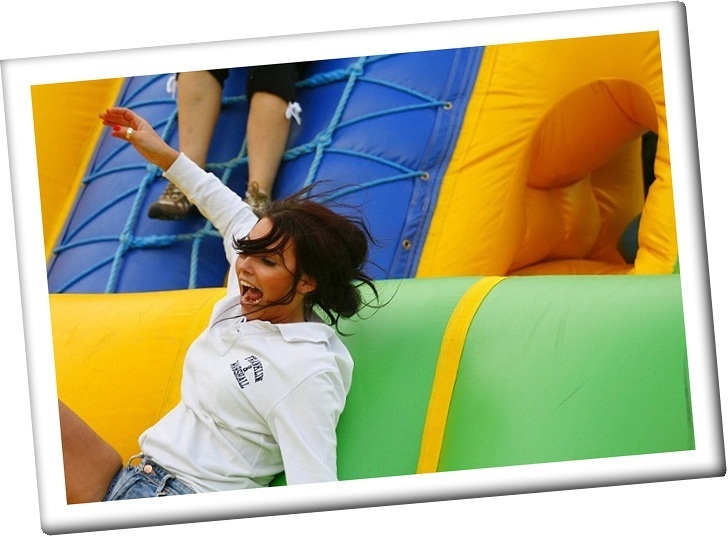 https://www.itsaknockout.org/wp-content/uploads/2017/01/team-happy-day-glows.jpg 646 947 Phil https://www.itsaknockout.org/wp-content/uploads/2017/01/its-a-knockout-300x138.png Phil2013-08-22 14:57:472019-02-11 11:50:41Can Charities Really Make Money from a Knockout Challenge? 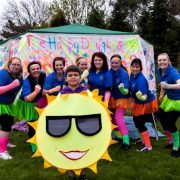 Knockout Challenge have confirmed a number of fundraising Challenge Days for summer 2013. If you are able to support any of the charities in your local area, then get together a team and come and join us. A Knockout Challenge is the perfect way to have a day out in the sunshine and support a good cause. We’re counting on the weather being very kind over the next couple of months and even if it doesn’t, we know you’re a tough bunch who aren’t going to be put off by the weather. These are the dates we have at the moment, and we’re adding new dates all the time. Give us a call if you’d like to host your own event, or keep checking our Face Book page for new event in your area. You know you want to……………..
Where will you be on Sunday 12 May? If you’re anywhere near Truro (and if you’re not – get there!) Truro Rugby Club is the only place to be! 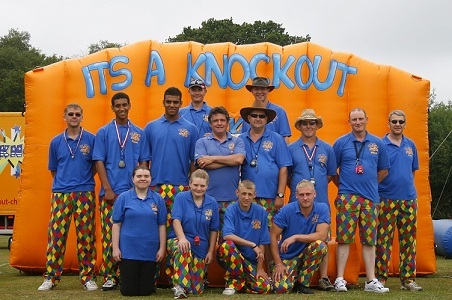 We’ve got a Knockout Challenge fun day to raise funds for Children’s Hospice South West. 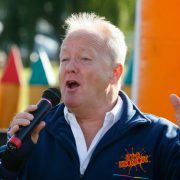 We are really pleased that Frank Bruno and Keith Chegwin will be joining us for some summertime Knockout fun. A lot of people will remember both of them from the channel 5 version of “It’s A Knockout” back in the early noughties. Keith Chegwin was co-presenter with Lucy Alexander from 1999 to 2001, with Frank Bruno starring as their referee. Why not recapture some of that old magic by joining one of our Knockout Challenges featuring these two charming gents. For those of you who don’t know Frank and Keith (where HAVE you been? ), here is a brief bio on our two favourite Knockout celebrities. A born and raised Londoner, Frank started his boxing career at his local Wandsworth club, before moving to school in Sussex where he started training more seriously. Frank had a glittering amateur career through the Philip Game Amateur Boxing Club, eventually becoming the youngest ever Amateur British Champion at 18. Frank’s professional career started in 1980 and after numerous bruising battles Frank became World Heavyweight Champion in September 1995 by outpointing McCall over twelve rounds. The whole of London celebrated, and cheered Frank through the city on an open top bus. Frank went on to develop an acting career and made many appearances on the early Comic Relief programmes. 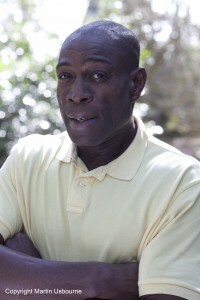 He was awarded an MBE in 1990, and is a member of Equity. Having suffered with depression himself, Frank now devotes some of his time to mental health charities. He is an accomplished speaker and is in much demand on the after dinner circuit. Keith Chegwin started his career as Eggead Wentworth in The Troublesome Double (1967) and Egghead’s Robot (1970). He has also appeared in Roman Polanski’s MacBeth, plus a string of smaller roles in films throughout the 70’s. Apart from acting, Keith has had a successful career in the West End, as a singer, and as a radio DJ. Most of us remember him best as the co-host of Swap Shop during the 80’s. After a spell out of the spotlight he came back to co-host It’s A Knockout in 1999. When it comes to fundraising no-one does it better than the BBC – especially for Children In Need. While no-one can compete with the BBC, they do offer loads of good ideas that can be used for school fundraising ideas These suggestions are to raise funds for Children In Need, but they can be used for any other school fundraising projects. A Knockout Challenge is another option – it is a lot of fun, and requires minimal effort from hard-pressed parents and school staff to make it successful, so bear it in mind for the warmer months.